In a way, Spur kinda reminds me of old arcade games. Late 1980s old that is – not Atari 2600-ancient. Anyway, you play as a gunslinger hell-bent on reaching the bottom of a ravine as fast as possible, dodging all kinds of nasties along the way. Why? Who knows, and besides, do ya really need a reason to smack slugs and collect clocks? Didn’t think so! According to the studio behind Spur, the game came to life as an homage to the popular House of Dead Ninjas, although with less ninjas and more cowboys. While things are bound to change as development progresses, for a prototype, my time spent with it [Spur] was actually problem-free, if a bit on the easy side; especially compared to its inspiration, which tends to be downright brutal! Equipped with a six-shooter (because, cowboy) and the ability to ground stomp through layers of dirt, your job as this nameless protagonist is to descend as fast as possible. But there’s a catch: you only have 24 seconds, and unless you collect another clock in time… game over. No continues, no checkpoints. Just you and the ravine, in what seems to be an endless runner; in its current state, anyway – remember: prototype. 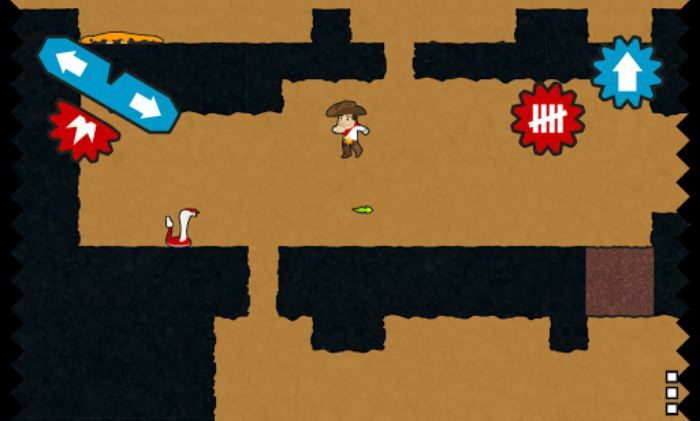 Play as the quick-drawing cowboy, who is faster and more nimble than any enemy he encounters. Jump the two-legged foxes and detonate the exploding spiders. After each run, you’re awarded with cacti (a rather odd choice), based on how far you managed to descend. Since these are “added to your grand total”, I have a feeling an upgrade/unlock system of sorts will be added in the future. But for now, you’ll have to settle for a local leaderboard, leaving you to best your own run. Speaking of upcoming additions/changes, I really hope they’ll do something about the user interface, as the current button layout leave much to be desired on my 4″ phone. Aside from that though, Spur has plenty potential, given a bit of extra substance (like my cacti spending idea, for example). And since it’s quite playable in its current state, I’d say grab the prototype from Google Play right now, and step into the (running) shoes of a poor lonesome cowboy. Clock’s ticking!